Last Friday the kids, parents and staff of Vintage Parkway enjoyed a very successful Harvest Carnival organized by the PTA. The high point for most, The 6th Fright, which is the name I have given the haunted house since taking charge of the yearly project. This year was a lot of work, a lot of stress, but the returns in the form of crying, laughing and screaming were worth with. After last year, I was very disappointed and honestly had very little inspiration to put in weeks of work with little return. Seen from a guest point of view, they don’t understand the time, effort and work that goes into a haunt, all they see is the final product. This year it wasn’t until September that I got around to putting together a layout and idea for what the haunt would be. In fact, it was the best haunt we have had in the 3 years I have been in charge. Unfortunately this haunting season started off rough, as I took vacation in early October, planning on getting into the school during their fall break, while my wife and son played at Disneyland. What I wasn’t told, a week later was the district decided to re-tile the kitchen floor, which delayed janitorial from waxing the auditorium. All this confusion added up to being delayed two weeks and finally getting access the stage on October 12, providing 10 days to get the haunt up. The most challenging part was yet to come. I knew I would not have my haunt partner, Mark G. as he held school hours and coached softball and soccer for his daughter. Thankfully he made a cameo and put in a few good hours. I also have Tom V. to thank for his knowledge and help in finishing off the details. There was one mom, Cathy W. who hung clown masks the 4th graders painted in a hallway. Beyond that, there was no help from ANY parents, which is very unfortunate. The biggest problem Mark and I faced last year was getting the adult participation on the day of the haunt. Sorry, I can’t trust teenagers to be responsible, as they have acted unruly and wild the past 3 years. Thankfully the PTA (as usual) stepped up and delivered five dads who each took up roles in the haunt. This was a first! 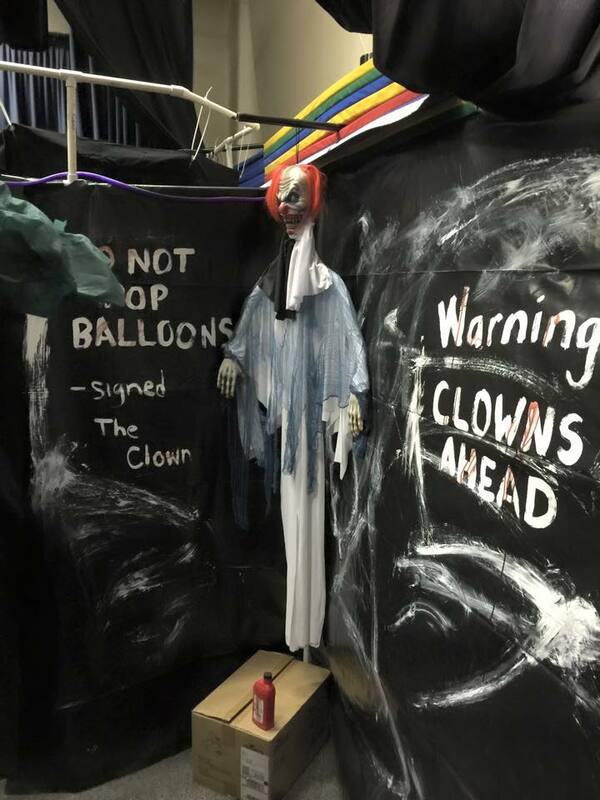 Parents need to realize if there is no one to take responsibility after next year, the haunted house could fall by the wayside, which means the Harvest Carnival doesn’t make the as much money, which means the teachers and students lose. Then again, I guess most parents don’t care. As for the haunt, it turned out to be a successful night full of thrills and excitement as the screams returned! What made this successful was the simplicity of the layout with a total of 5 areas or guests to walk through. This year I finally decided on a clown theme, which was introduced last year, but we took it up a notch this year. Just wait for next year (apologies to all those who despise clowns…mwhahaha!)! There were some Internet inspired, clown ideas I wanted to include, but time got the best of me and they will be worked on for next year. This included clown costume, which I kept pushing off, only to buy a Spirit costume a few days before the haunt. 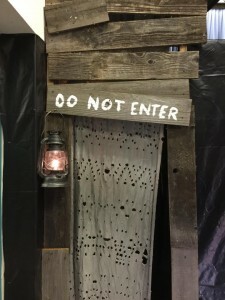 This year we brought back two rooms; dot room and drop panel hallway back to The 6th Fright. Both are excellent scares and for the first time, I got to experience the dot room while standing in front of the costume, but in it. What an outstanding scare! The drop panels worked well, but I need to fix them before next year and come up with a better way to let the individuals behind the panels know when guests are coming. Tom recommended a motion sensor. Last year I used a monitor and video camera, which didn’t come off as it did well as it did for Hellmouth (see video). Hopefully we can get this perfect in 2016. The dot room is getting a bit dated, as this was the third year I had hung the sheets. 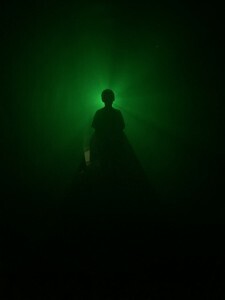 It’s a great haunt idea, but many guests at the school knew who or what was coming when they walked into the 9’x9′ room. Still the scares were awesome! The screaming was music to my ears! The only downside this year was the zipper on the Black Zentai Body Suit broke, which means we will have to buy and repaint the suit for next year. This would also be the time to repaint all the colored dots as well. Lots of work, but I do feel the reward would be worth it. 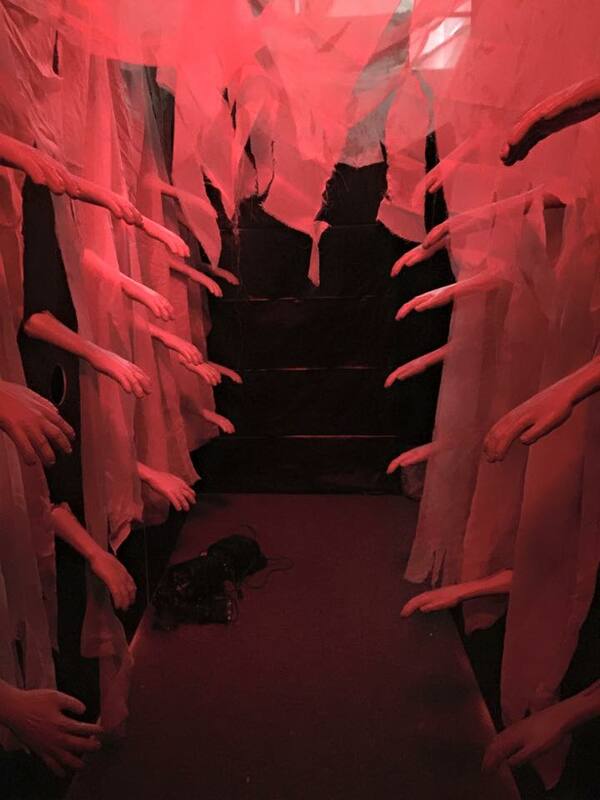 To start the haunt guests made their way through the entrance and turned right into the Hallway of Hands. I built 7 more wooden wall panels, each measuring 4’x8′ to allow us to screw the hands into the hallways. Inspiration came from this Pinterest post. Originally I had planned on 60 down this 12′ hallway that turns right, but only bought 36 severed arms. In addition to the plastic arms, I drilled five sets of 4 inch holes for kids to stick their arms through. This was the only participation I planned for 5th graders inside the haunt for numerous reasons. First it takes time away from processing guests to switch out kids who want to scare. I tried to minimize that time by using them near the entrance. Unfortunately some kids took it upon themselves to stand around the dark corners scaring people or worse yelling through the holes instead of placing their arms in them. At the end of the drop panel hallway I was planning on narrow hallway to transition to the dot room. Unfortunately I miscalculated the stage dimensions by 2 feet and this hallway was a bit wider than I had originally anticipated. 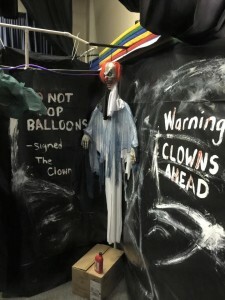 I did however make the area work, hanging two clowns, while smearing white paint and writing on the walls, then dripped blood over the writing. I also added 6′ twitching clown I named Twitchy, activated by a foot pad. This room also had the emergency exit, just in case someone couldn’t continue on. 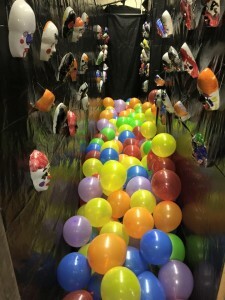 Playing on the clown theme I loaded up a 3 foot wide hallway with 200 balloons and hung clown masks painted by the 4th grade classes. This 20 foot hallway connected the dot room and the entrance to the laser vortex. The balloons were a bad idea, as they floated through hallways into rooms they weren’t supposed to be in. I think most of balloons ended up in the laser vortex room. Those that stayed in the hallway were popped by myself, as the clown or by guests. About 10 feet down on the right side was a notched that housed Chester the Jester, a clown in toy box that would pop up when activated. This was also the hallway that I used to scare in. It also allowed me quick and easy movement to any part of the haunt within seconds to check on guests or those adults who were helping to scare. The final scare of the night was a new addition to the haunt, the laser vortex, which was at the end of the balloon hallway. Can’t tell you the number of people who stopped and had no idea where to go with ‘DO NOT ENTER’ painted on the vortex entrance. No problem, as the crazy clown would usher people in the proper direction. “Walk toward the green light!” Once inside it was a quick right turn into the laser vortex. This was the first time I had attempted this sort of room in a haunt and I wasn’t sure if it could be pulled off indoors, let alone in just 20 feet of space. Inspired by this laser vortex video, I figured this would be something neat to add to our haunt. I found online instructions, ordered the parts and with the help of Tom, we put it together and began testing. The 200mW green laser worked outstanding! I coupled this with a Chauvet 1301 Hurricane fog machine and a fan for a stunning effect on the night of the haunt. Even at 20 feet, the hallway was long enough and at 8 feet wide allowed people to make their way safely to the exit. We did struggle to get those fantastic effects as seen some of the You Tube videos at time. Even had some teenagers kick over the fog machine remote and it spewed too much fog out with ruined the overall effect for a time. Still I was very pleased with this inexpensive haunt idea. Here’s video from our testing a day before we went live with the haunt. There are some changes that will be made for next year, but it was still a very effective. Thanks must also go out of Mark Klem, who provided an original sound score for the laser vortex. All in all it was a very successful night. I was a bit disappointed, with about 30 minutes to go in the Harvest Carnival there were very few people coming through. I was shocked when I walked out and there was no queue, which is something we have not seen in the past few years. Not quite sure what to make of it, but there was a long line stretching past the haunt for the trunk or treat display. Still can’t figure it out. I do we know we took a lot of tickets and got many, many people through. Next year will be my final year in charge of the haunt and I guarantee we will go out in style!